I love using Mod Podge to upcycle furniture and other household objects, I’ve transformed cupboards, stools, the possibilities are endless! 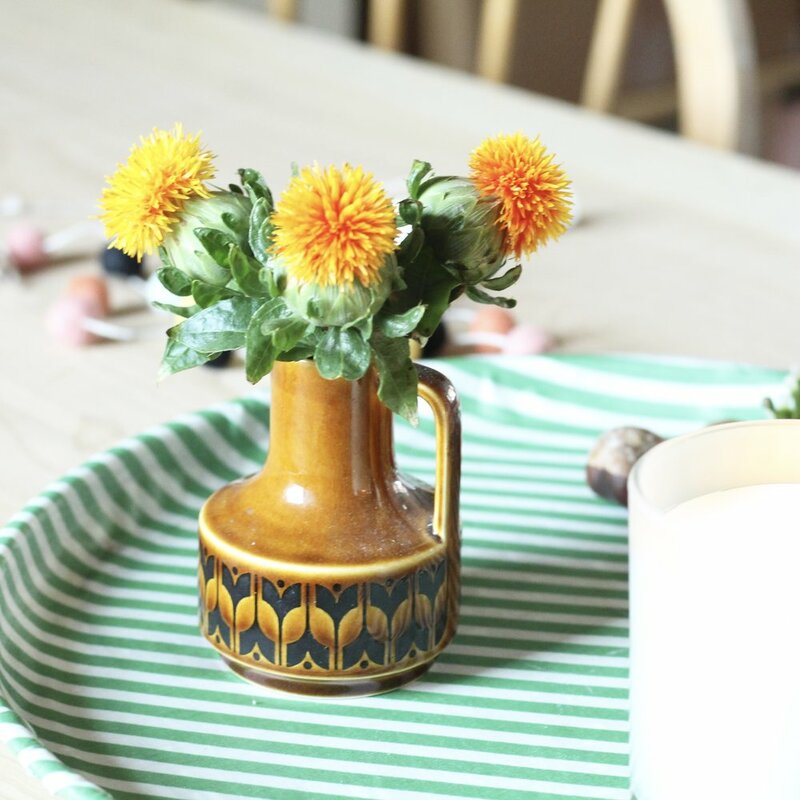 But if you want to start simple with this technique, this tray project is the perfect place to begin. Cotton fabric, enough to cover your tray, and overlap the sides. Start by making sure your chosen tray is clean and dry. I got my tray from Wilkos for a couple of pounds. You could use an old tray you have, just be careful if it has a pattern on it, that the pattern doesn’t show through the fabric you’ve chosen. Now lay you fabric out, wrong side up, and draw around your tray, giving yourself enough extra fabric to wrap around the rim of the tray. I did this freehand but you might want to be a bit more precise with the way you do it. Cut the shape out. Now coat the tray with a layer of Mod Podge, make sure it’s an even layer, not too thick. Take your fabric piece and lay it over the tray taking care to keep it central so you have an equal width of extra fabric to wrap around the sides. Smooth the fabric down, working on the edges especially, its useful to use a dry brush to get the fabric right into the edges. As I was working with a round tray, there was always going to be an element of gathering, but get it as neat as you can. If you find the Mod Podge is seeping through the fabric, don’t worry as we’ll be covering the top of the fabric in another layer of mod podge later on. At this stage, leave the tray to dry. This should only take an hour or two. Now turn the tray upside down, and cover the underside edges with Mod Podge. Now start to fold the edge of your fabric over, making slits in the edge of the fabric where needed, to allow the fabric to sit neatly. 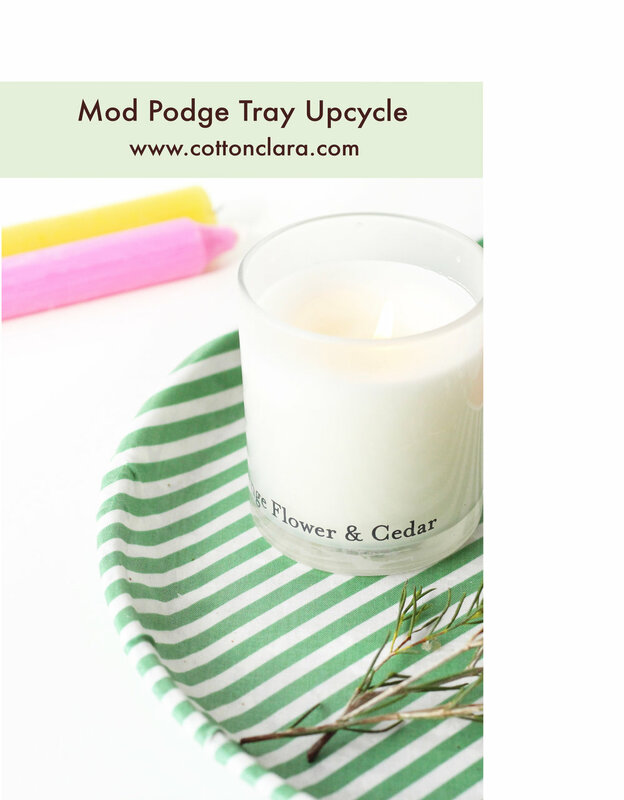 As you go along, you can be adding more Mod Podge to the top of the fabric to try and get it to sit neatly and as close to the tray as possible. Leave this to dry. Now turn the tray back over so it’s right side is up. Cover the whole tray in another layer of Mod Podge. This will make the tray pretty much water proof, and wipe clean, although be careful, if you leave standing water on the tray, it will mark and damage the surface. Once this has dried, turn over the tray one last time and give the underside a final coat of Mod Podge to fully seal and stick the edges of fabric down.